One interesting remark is that when fighting Nexus-Prince Shaffar he will continue to spawn Ethereal Beacon and these will after 10 seconds convert to Ethereal Apprentice. The Beacons are worth 8 rep but the Apprentices are worth 20 so it's worth mentioning that you should simply off-tank the boss and keep waiting for his spawned Beaconds to turn into Apprentices, then kill those! 4) I took the quest Ethereum Secrets and looted 7 keys in roughly 50 kills, all drops from Nullifiers, to the South and to the East of the quest giver. I figured that the drop-rate might be higher if your on a quest that requires that item, it appears this is the case. Just pull Nexus-Prince Shaffar back to balcony located in the corridor behind him, and wait for him to spawn Ethereal Beacons which will in turn spawn the apprentices. The beacons spawn about once every 10 seconds, and after about 5 seconds they turn into Ethereal Apprentices. The apprentices give 23 rep without any perks or racials. This means you can grind approximately 138 rep per minute, or 8280 rep per hour without perks. If you find you're having problems staying alive, just drop down from the balcony, run out and reset the boss. Go into a Heroic Mana Tombs run, clear your way to Nexus-Prince Shaffar and ensure your pet gets aggro. Have your pet put on passive, tell him/her to go stand to the side and have them heal up when they get low on health. The boss will spawn an Ethereal Beacon every 10 or so seconds, which about 5 seconds later summons a Ethereal Apprentice and then vanishes. The Ethereal Apprentices give 23 rep, 24 if you have the second Mr. Popularity guild perk, and 25 - 26 if you're Human on top of that. Round that to the nearest ten and you need 180 Zaxxis Insignia to hit Honored. Round that to the nearest ten and you need 400 Zaxxis Insignia to hit Revered. Round that to the nearest ten and you need 680 Zaxxis Insignia to hit Exalted. NOTE: This is NOT taking into account Quests or Human racial ability of Diplomacy! * Ethereum Prisoner I.D. Tag drops off the mob inside the ethereum prison bubbles at Manaforge Duro. You must tag these mobs to ensure a I.D. I had a 91.4% (32 out of 35) success rate of dropping the I.D. from the mobs. I'll go back to farming Zaxxis Insignia. The easiest method I found to farm this rep was as a lvl 90. Just run through Heroic Mana-Tombs, but being very cautious not to engage any of the bosses. This is important, because you can't reset the instance if you kill a boss. As a lvl 90 Shadow Priest I had no problem rounding up every mob before each boss and then ae'ing them down. As your aggro radius is so small you can skirt around every boss, including Tavarok (go to his left side) and Nexus-Prince Shaffar (also the left side). Once past the prince, it's a short walk to the entrance. Walk outside, reset and then repeat. I found this process much quicker and a much smaller drain on the mana pool as there is no tether limit inside instances, whereas outside (collecting Zaxxis Insignia for instance) there's only so many mobs you can round up before some start running back to their spawn locations. After achieving Honored, make sure you visit Netherstorm to pick up and complete a quest chain that begins with A Mission of Mercy http://www.wowhead.com/quest=10970. This leads to you being able to farm Ethereum Prison Keys from the Heroic Run of Mana Tombs. And that will also enable you to get The Eye of Haramad once you hit Exalted. This allows you to permanently open the final Stasis Chamber for the bonus boss Yor. Plus according to this comment, Ethereum Prison Key#comments:id=1950078 Ethereum Prison Keys are also good for acquiring several other BC faction reps. Note you'll need about 15-20 Ethereum Prison Keys in order to get Mark of the Nexus-King and the MT Heroic Quest that follows. But save all your other Keys after that for normal prison openings if you want extra faction rep, like Keepers of Time, Lower City etc. I has done farm up Zaxxis Insignia AND Ethereum Prison Key from 2 Zaxxis Npcs at The Heap in the Netherstorm. It's is Zaxxis Raider and Zaxxis Stalker. It took me a week or more for grinding reputation to Exalted. So for Ethereum Prison Key, take it to open bubble at west of Manaforge: Ultris, their is some random npcs that reward you 500 rep of random outland's reputations and also some hostile npcs drop Ethereum Prisoner I.D. Tag. Turn in Ethereum Prisoner I.D. Tag at north from the bubble area and npc is Commander Ameer then reward 250 rep for Consortium. 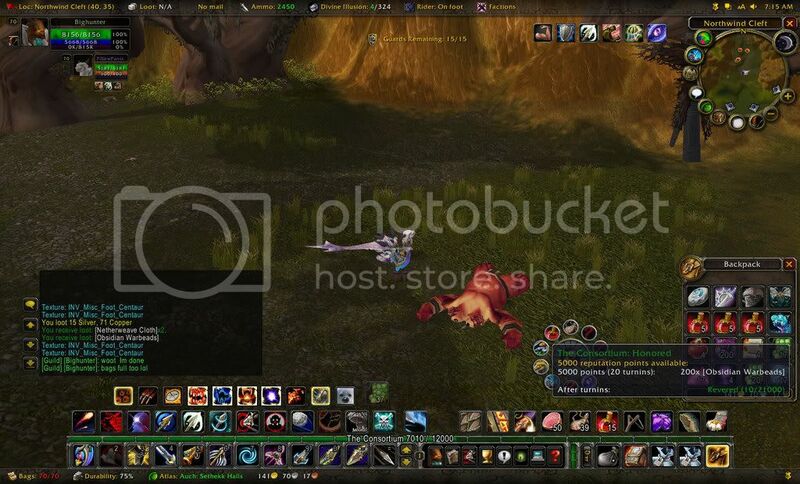 Characters trying to simultaneously earn reputation with the Mag'har or Kurenai and the Consortium may want to focus on killing ogres (Boulderfist, Warmaul) in Nagrand and saving the Obsidian Warbeads for Consortium turn-ins. The only caveat is the drop rate, which is roughly 33% for the warbeads, while it is 50% on the insignias. If you are level 70 and want a faster grind without concern for Mag'har\/Kurenai reputation, then you may want to grind insignias instead. Then again, the ogres are generally easier to grind, ranging from level 65 to 67. The choice is ultimately up to the player.